Ignasi Fina, researcher at the MULFOX group, gave a talk on nanoscience and materials. He also explained the students what it is like to be a scientist nowadays, and how to become one! After the talk, the students could visit the "Low temperatures and Magnetometry Lab" with Bernat Bozzo, the X-ray Diffraction Lab, with Anna Crespi, Joan Esquius and F. Xavier Campos, the CleanRoom with Marta Riba, and the "Matheroes: Supermaterials, the materials of the future" exhibition, with Anna May and Xavier Granados. We would also like to mention that among the students who came, one of them had been with us in the program Joves i Ciència 2018, this last summer! She was very happy to be back at the ICMAB! 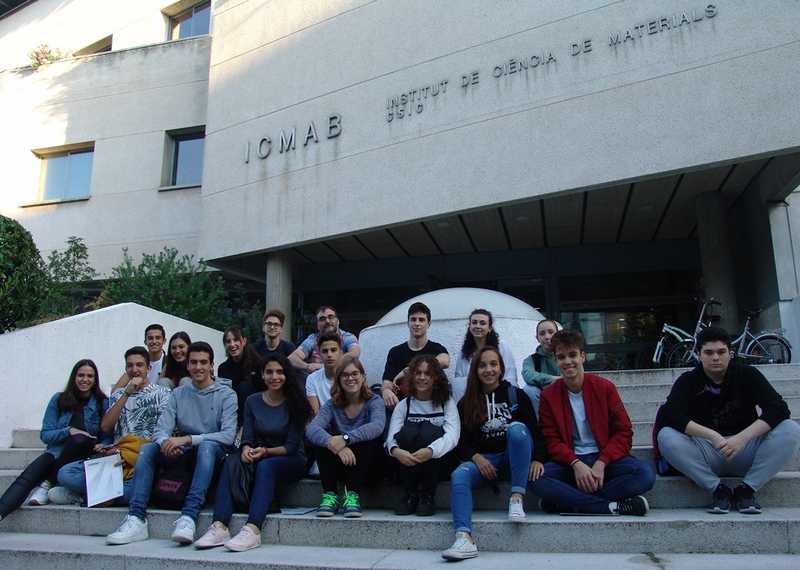 The students had a very intense day, since in the morning they were at ICFO - The Institue of Photonic Sciences, and the students from 1st BTX visited the IMB-CNM-CSIC, our front door neighbors. Thank you for the nice visit, and thank you to the professors who coordinated the visit!